RockStar MD: Funny Pic - Why you must be careful when you pick your nose.. 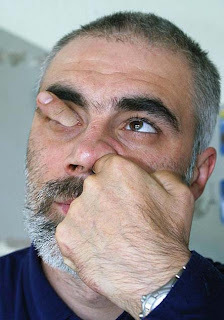 Funny Pic - Why you must be careful when you pick your nose.. It is an important lesson for all of you..
Not only you must use tissue when you pick your nose but also you must be careful to use that finger of yours. i think it's real... aku pernah liat langsung, tapi gak pakek tangan, pakek balon panjang hieeeekkk.... seyeemmm..